SKU: N/A. Category: Hallux Rigidus. Dr Foot Pro Hallux Rigidus Insoles have a 4 degree forefoot 1st metatarsal post to redistribute pressure away from the 1st metatarsal joint, only use these insoles if you have been diagnosed with Hallux Rigidus. Hallux rigidus is arthritis of the main joint of the big toe in the ball of the foot. It is a wearing out of the joint surfaces. It is called “hallux rigidus” because its main feature is stiffness (“rigidus”) of the big toe (“hallux”). Some people get stiffness in this joint with little or no obvious arthritis – this is called “hallux limitus” because the toe has limited movement but is not absolutely stiff. Dr Foot Pro Hallux Rigidus Insoles have a 4 degree forefoot 1st metatarsal post and are designed to fit into normal shoes, lateral cutaway provides an easy fit for almost any type of shoe. The wearer will adjust quickly and find the device comfortable to wear. This insole provides the functionality and stability of the full-length insole but can be placed into all types of footwear for men and women. 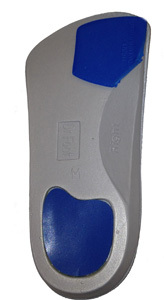 Dr Foot Pro 3/4 Length Insoles provide the support you need to insure treatment of hallux rigidus.